Congregation Shaar Hashomayim was founded by English, German and Polish Jews. The Congregation rented a room on St. James Street for $10. On July 12, the cornerstone of the first Ashkenazic synagogue in British North America, Congregation Shaar Hashomayim, was laid at 41 St. Constant, now de Bullion Street. It accommodated 150 men and 50 women. The building was 48 by 111 feet. 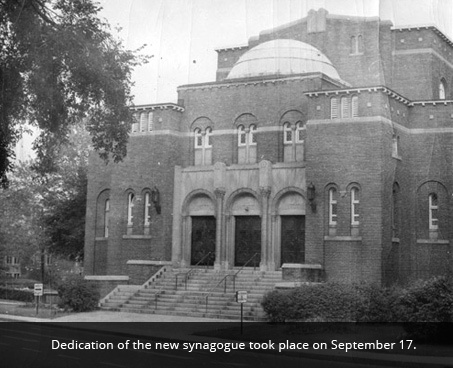 The services were modeled after the Bayswater Synagogue in London, England. 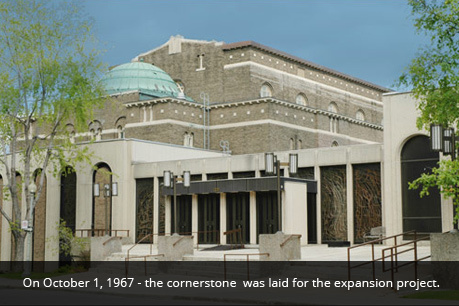 On October 21, the cornerstone for a new synagogue was laid on McGill College Avenue by president John Edward Moss. 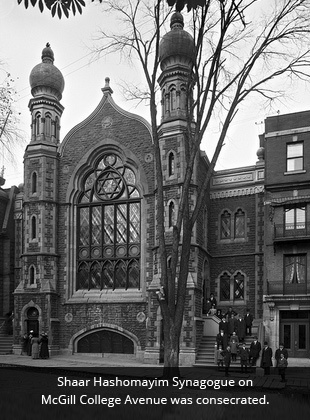 Shaar Hashomayim Synagogue on McGill College Avenue was consecrated. Final cost was approximately $40,000. 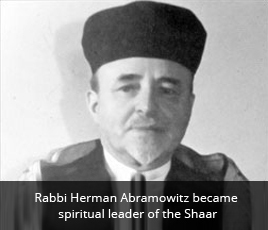 Rabbi Herman Abramowitz became spiritual leader of the Shaar Hashomayim, a position he held until his death in 1947. The congregation of Shaar Hashomayim grew to include 300 member families with 900 members. The name Congregation Shaar Hashomayim was incorporated. It is interesting to note that Shaar Hashomayim once owned the land where the Montreal Forum was once located. During the First World War, the land was sold. This was also the time of increased Jewish immigration to Canada and Montreal in particular. 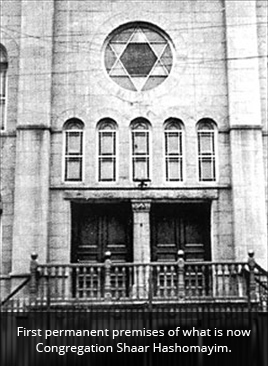 The McGill College Avenue Synagogue was becoming too small and the Jewish population was shifting westward. In June, Shaar Hashomayim procured land at Kensington Avenue and Côte St. Antoine in Westmount. The cornerstone of the current synagogue, from Israel, was laid by the president, Lyon Cohen. Furnishings from the McGill College location were sold to Beth Shlomo on Bagg Street for $1,500. The furnishings consisted of the ark, the marble staircase, the benches and the chandeliers. Rabbi Wilfred Shuchat was appointed Rabbi of Congregation Shaar Hashomayim, a position he held for 47 years. The membership of Shaar Hashomayim grew to 1,750 families, 4,000 individuals. The synagogue was only designed to serve 300 families. On the High Holy Days, there was no room for children. An expansion to the Shaar was needed. On October 1, the cornerstone was laid for the expansion project. The Pavilion of Judaism at Expo’67 was created by Rabbi Wilfred Shuchat. Stephen Glass was appointed Director of Music. Reverend David Woolfson was appointed Ritual Director. Rabbi Wilfred Shuchat was appointed Rabbi Emeritus. Granting of Coat of Arms to Congregation Shaar Hashomayim. Capital Campaign and major renovation project initiated. Adam Scheier was appointed Rabbi. Gideon Zelermyer was appointed Cantor. Dedication of refurbished facilities and renaming of Metcalfe and Kensington Halls to Lande and Victor Halls respectively. Capital Campaign Lead Donor Wall dedicated. Zomet Institute certifies sound system for use on Shabbat. Maharat Rachel Kohl Finegold, first ordained Orthodox woman, becomes member of clergy team.